Devin Nunes will continue to lead the intelligence committee but Mike Conway of Texas will take charge of the probe. WASHINGTON — House Intelligence Committee Chairman Devin Nunes, R-Calif., temporarily recused himself Thursday from all matters related to the committee’s ongoing probe into Russia’s interference in the presidential election, as House investigators look into ethics allegations against him. Nunes said in a statement that he decided to recuse himself after “several leftwing activist groups” filed complaints with the Office of Congressional Ethics about his leadership. 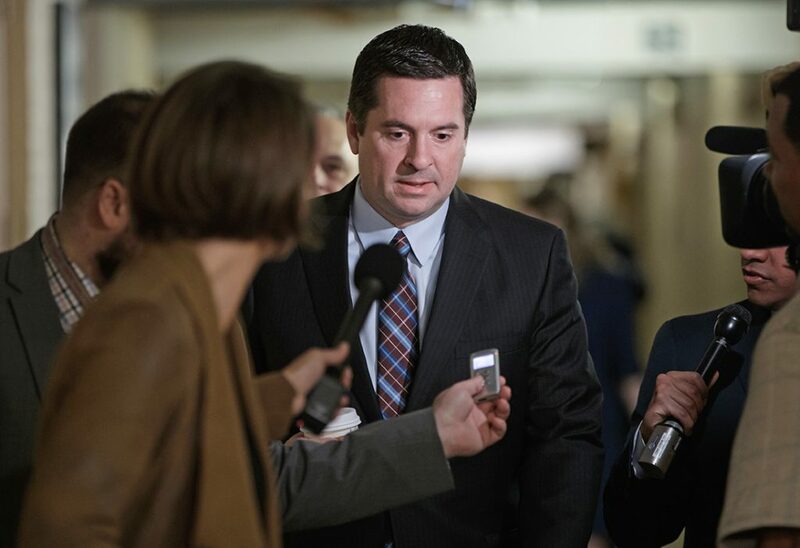 Nunes called the charges “entirely false and politically motivated,” but said his recusal would be in effect while the House Ethics Committee looks into the matter. Nunes said in his statement that he has requested to speak to the House Ethics Committee “at the earliest possible opportunity in order to expedite the dismissal of these false claims.” In the meantime, Nunes said, Rep. Michael Conaway, R-Texas, will take the lead on the Russia investigation, with assistance from Reps. Trey Gowdy, R-S.C., and Tom Rooney, R-Fla.
House Speaker Paul Ryan, R-Wis., said Thursday that he still has confidence in Nunes, and does not think he did anything wrong. “But Chairman Nunes wants to make sure he is not a distraction to this very important investigation,” he added. Nunes has come under fire in recent weeks for going to the White House grounds to meet with a secret source and view documents he said suggest that President Donald Trump and his transition team members’ identities may have been improperly revealed in surveillance reports of foreign targets. Nunes, who served on Trump’s transition team, did not alert his colleagues on the Intelligence Committee before making the trip, or before briefing the press and Trump about what he saw the next day. Democrats have accused Nunes of coordinating with the White House about those reports, and suggested that in talking about them publicly, he might be releasing classified information. They have also accused Nunes of coordinating with the White House about the witnesses appearing before the committee, after he canceled a planned open hearing with the former director of national intelligence James R. Clapper, former CIA director John Brennan, and former acting attorney general Sally Yates. The Washington Post reported that the White House had sought to prevent Yates from testifying. Nunes pledged to “continue to fulfill all my other responsibilities as Committee Chairman” in matters unrelated to the Russia probe. He also said he welcomed Conaway’s leadership of the investigation.